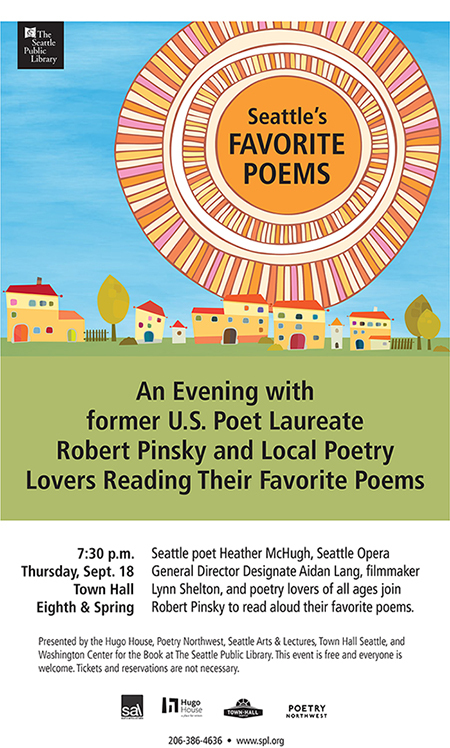 Seattle’s Favorite Poems with Robert Pinsky – Free Event! Celebrate beloved poems with other local poetry lovers in this special event, which is free and open to the public. Initiated in 1999, Seattle’s Favorite Poems brings together local luminaries, poets, and community members for an evening of –you guessed it–everyone’s favorite poems. Featured readers include Robert Pinsky, former U.S. Poet Laureate; Poet Heather McHugh; and Aidan Lang, Seattle Opera’s General Director. Hosted by KUOW’s Marcie Sillman, the night will also feature community members reading their chosen poems. Presented by: Town Hall, Seattle Public Library, Poetry Northwest, Seattle Arts & Lectures, and Hugo House. Elliott Bay Book Company is the partner bookseller for this event. Tickets: This event is free and open to the public; no registration required.